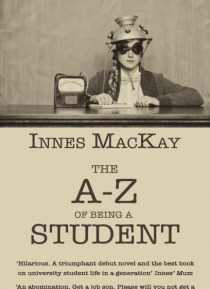 A-Z is set on the bridge between adolescent dreams and adult realities; and between the town of Oban where Innes MacKay grew up, and the city of Glasgow where he planned to buy his first penthouse. The first of his family to go to university, Innes had assumed that a degree certificate came with a job and a BMW. Then, at the start of his final year, three words from a course mate shatter his dream… s and leave him desperate to turn his time at uni into to an unlikely success story, rather than a fruitless, expensive withdrawal on his liver cells and bank account.